Looking for somewhere to satisfy your sweet tooth? If you’re staying in London for the long weekend, look beyond the average Easter egg and try one of these decadent Easter desserts. 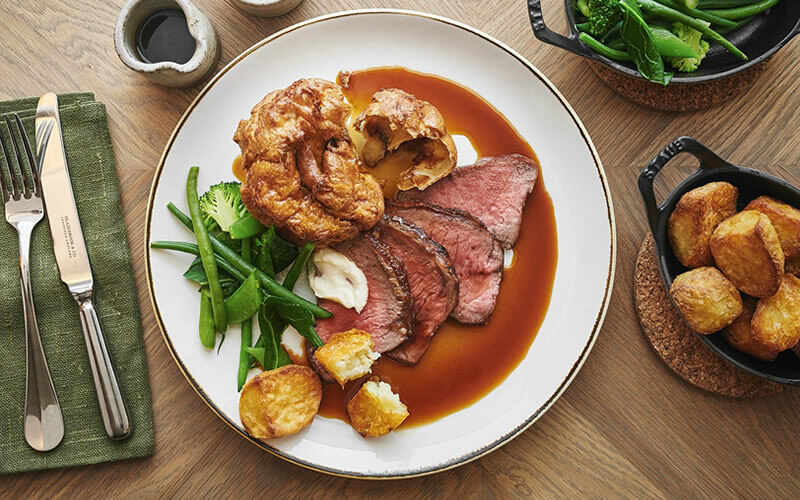 At Florentine, a short walk from the South Bank, they’re serving traditional Sunday roasts all weekend. Don’t fill up on Yorkshire puddings, though – you’ll want to save room for this chocolate sharing platter. 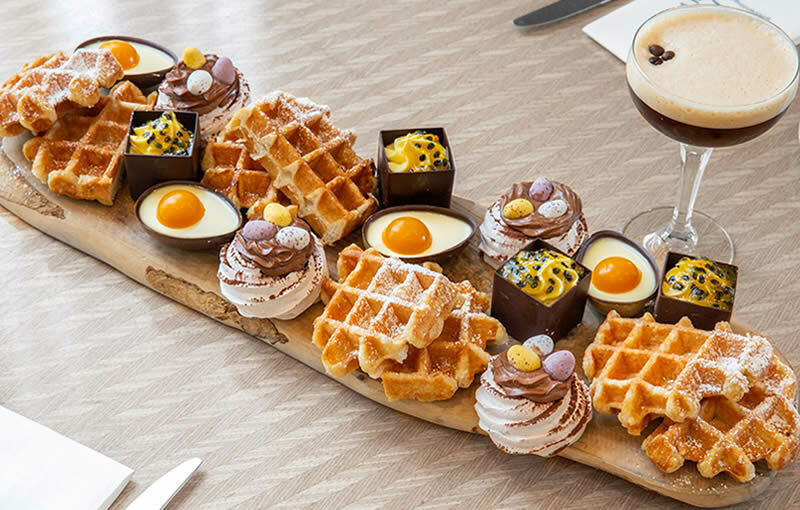 Designed to feed four, it features waffles with chocolate sauce, chocolate and lemon pavlova, and chocolate egg shells filled with panna cotta and mango jelly. Head to Maxwell’s for an all-American feast followed by their eggs-travagant Easter freakshake. 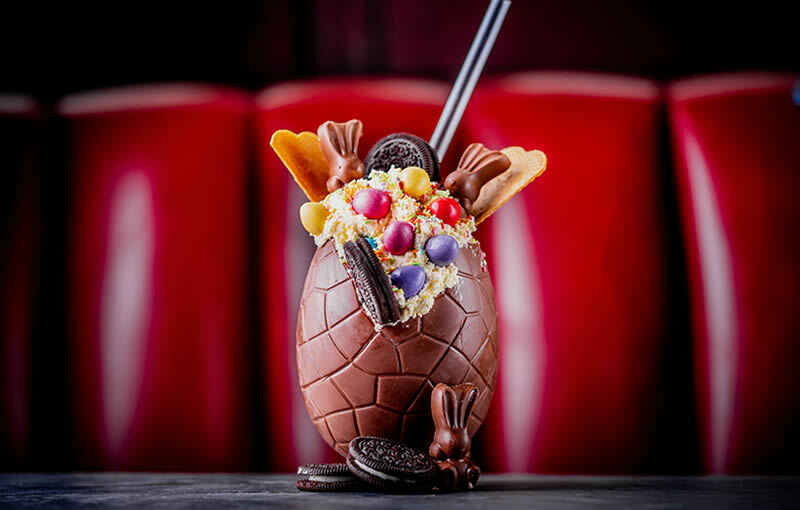 The giant chocolate egg is filled with chocolate milkshake and topped with whipped cream, chocolate bunnies, Smarties eggs, Oreo cookies, wafer biscuits, and rainbow sprinkles. It’s on the menu until Monday, priced at £12.95. YOLO is a new dessert bar in Covent Garden, specialising in cakes and desserts made with all-natural ingredients. 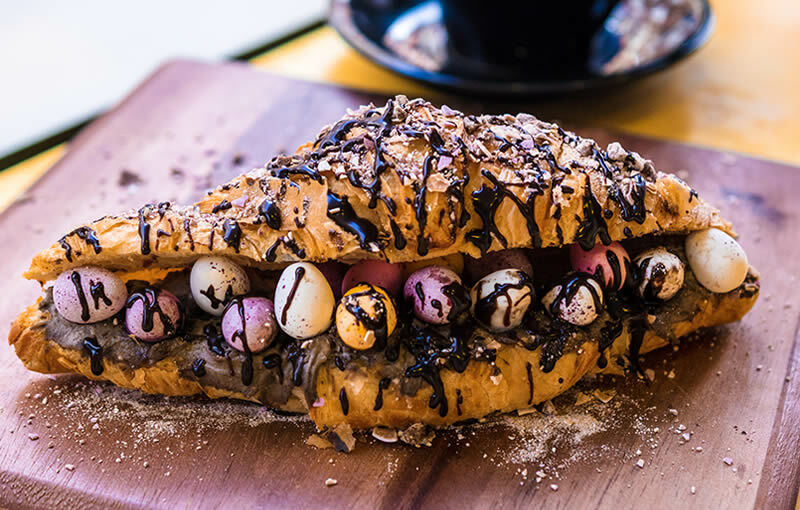 This weekend, they’re serving the ultimate breakfast treat – a freshly baked croissant filled with chocolate whipped cream and smashed mini eggs. J Sheekey is the perfect place to escape the West End crowds and sample some of the best seafood in town. Their set lunch menu – 3 courses for £30 – is available daily and they serve brunch accompanied by live music in the Atlantic Bar on Sundays. 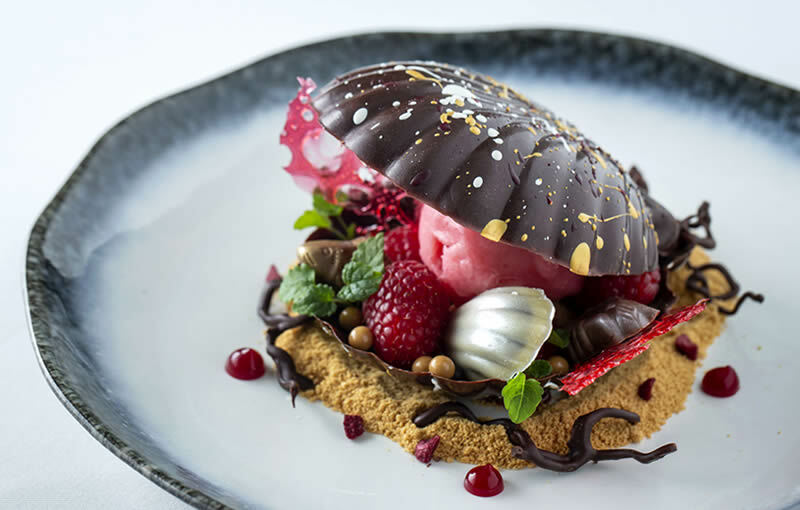 Don’t miss their limited edition seashell dessert – a chocolate shell filled with raspberry ripple ice-cream, raspberry compote, and mini sea-themed chocolates and jellies (£10.50). Enjoy the best of British food this Easter at VIVI, a glamorous 60s-inspired brasserie overlooking Oxford Street. It’s open all weekend, serving everything from bottomless brunch to late-night dinner and drinks. Their Easter menu is a bargain at £24.50 for three courses, including a glass of fizz or a Pink Floyd cocktail made with rhubarb vodka. 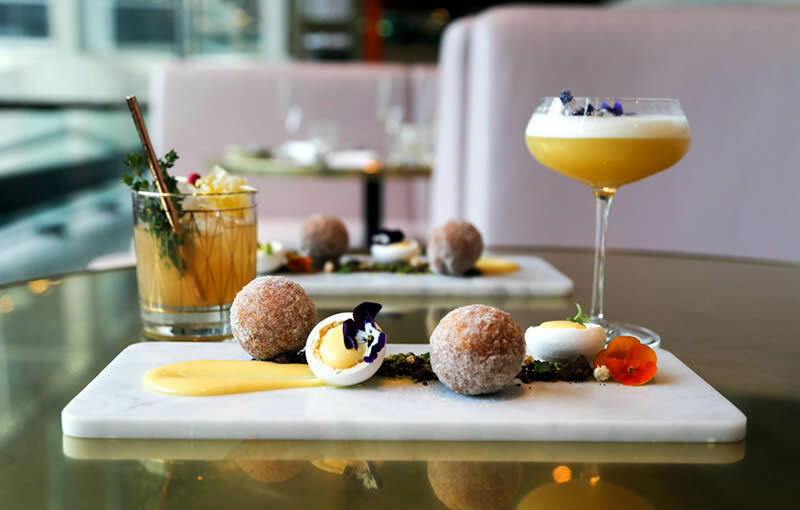 Save room for their bite-size Crème egg doughnuts with lemon curd and chocolate soil. 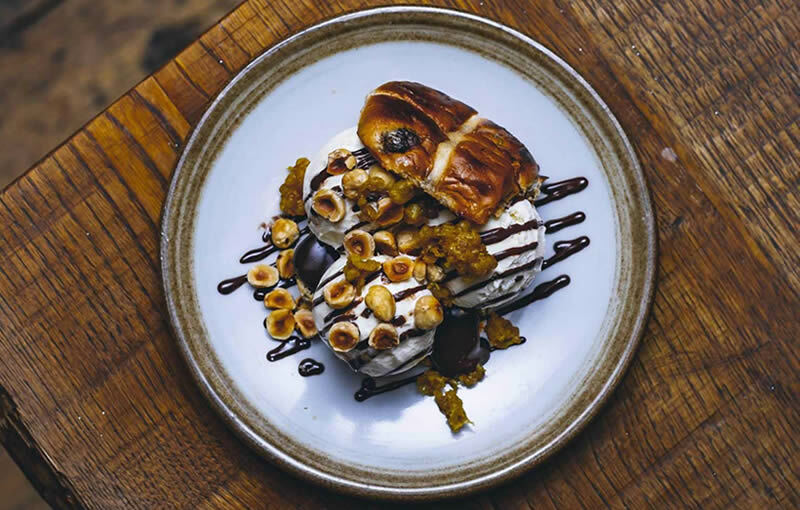 Scottish restaurant Mac & Wild is taking the hot cross bun to new heights this weekend. The buns will be toasted and glazed with Dalmore whisky, filled with salted caramel ice-cream, and drizzled with hazelnut and chocolate sauce. They’re available at their restaurants in Fitzrovia and the City until Sunday. After an extensive restoration project, the Mandarin Oriental is now fully open and looking better than ever. This Easter is the perfect time to visit, especially if you’re in the mood for indulgence. You can enjoy traditional afternoon tea in the elegant Rosebery lounge, accompanied by teas from around the world or sake, if you fancy something different. This weekend, their dainty sandwiches and freshly baked scones will be accompanied by Easter bunny-inspired sweet treats. Visit OpenTable to book or find out what more of London’s top restaurants have planned for Easter. Not rated for brunch until more recently, this part of London is great if you like your mid-morning poached eggs and smashed avocado. It’s even better if you’re after something a bit different. 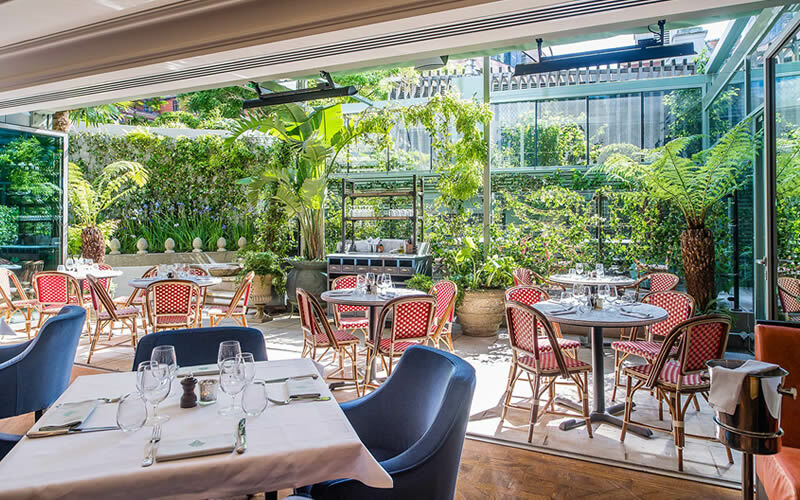 City workers and Ivy fans were in for a treat when a new branch of the chain opened close to Liverpool Street (the next closest is over the river), especially one with a hidden garden under a retractable roof, fully equipped to deal with capricious weather. Even almost two years later, few better options exist for a business-y brunch or weekend feast. Beany is part of the popular Daisy Green family, where brunch has always been a huge part of the small chain’s DNA. There’s a focus on good coffee (from The Roasting Party), while dishes are often either plant based or slightly left of field, like the Benny Boy Benedict with Parma ham, Comté, sourdough, sauerkraut, poached eggs and lemon hollandaise. Brunch has always had a special place on the menu at Caravan. Speaking of menus, it’s a long one, with pork belly with kimchi pancakes, fried jalapeno cornbread, buttermilk vanilla hotcakes, and the rest. Much like Beany, coffee is an integral part of the operation with their own roasts and blends. Noodles in the morning may appear as something of a curveball. Not the takeaway sort found at the back of the fridge, mind you. We’re talking house-made udon noodles in a hot or cold broth, with sweet tofu, prawn tempura, or smoked mackerel, should you desire. Yes, for those jaded with the usual toast and pair of eggs set-up, Koya has an answer. 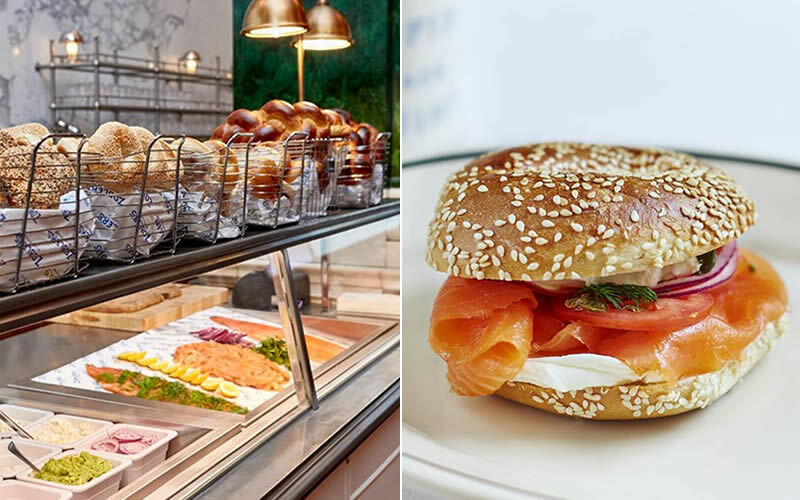 One of The Ned hotels’ eight restaurants, NYC-style deli Zobler’s brunch menu features items from latkes to challah French toast, though they’re keen to draw your attention to the Full English done their own way. It’s a hearty option, featuring fried eggs, pastrami ‘bacon’, beef franks, latkes, mushroom, tomato, cholent, and challah toast. Another to grace the grandiose Ned, Malibu Kitchen offers a Californian slant on brunch. A good thing too – their acai bowls and sea bass ceviche help bring a bit of colour and vibrance to Bank. Something’s going on at Bad Egg. Something where the chicken, before being subjected to the fryer, is coated in Doritos for that extra crunch, and where potato hash has a place in their cheeseburger. Here puritanical thinking goes to die, and Bad Egg are irreverently proud of that: it’s all ‘too messy for the sophisticated’, they say. Two Coppa Club options await you in the City – Tower Bridge and St. Pauls. The latter you may recognise due to the transparent igloos set up beside the Thames in the winter. At both joints, expect all the traditional brunch options, including pancakes, smashed avocado, and Benedicts done every which way. On weekends, brunch is bottomless at Ramsay’s BSK, where the prosecco flows freely. As for food, ricotta pancakes with honeycomb butter are a particular highlight, while, for the even more sweet-of-tooth, brunch encompasses some excellent desserts (sticky toffee pudding as first order of the day?). Another one for the not-so purists, on Saturdays from 11am, Temper serves up steak (rib eye, porterhouse, or T-bone) with pastrami poutine and fried eggs for all those willing. With endless cocktails it’s £40 a head, or a very reasonable £20 without. 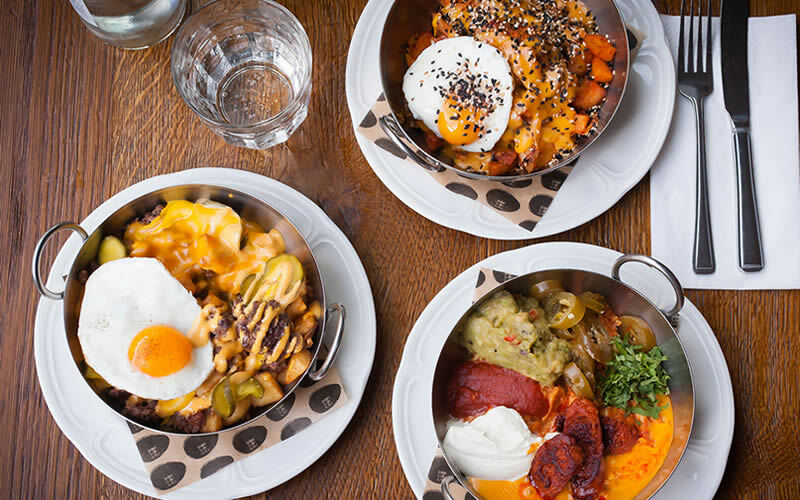 Visit OpenTable to discover more top brunch spots in London. Whether you’re looking for an indulgent weekend brunch or a traditional Sunday lunch for the whole family, you’ll find it in our round up of the best places to dine this Easter. 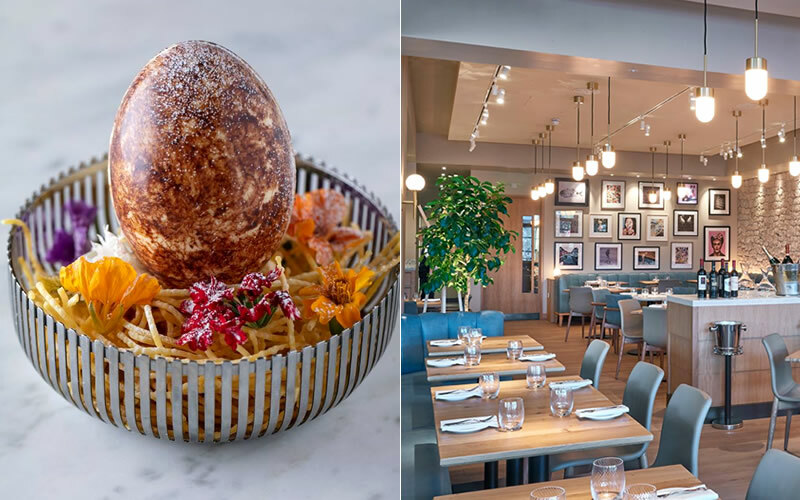 Fiume – Riverside restaurant Fiume is celebrating with four days of Italian-style bottomless brunch, plus a homemade chocolate Easter egg you can smash to reveal a prize. 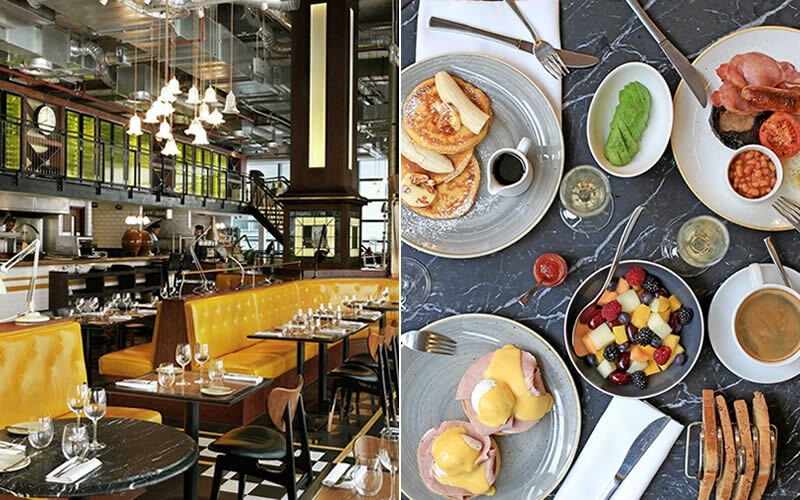 34 Mayfair – You can get your brunch fix at 34 all weekend long – they’re dishing up huevo rancheros, pancakes and more from Good Friday to Easter Monday. Don’t miss their egg-stravagant Easter Sundae topped with crushed mini eggs. The Piano Works – The Piano Works is launching their new bottomless brunch on Easter Sunday at their Farringdon and West End venues. For £50pp, you can enjoy two courses, bottomless drinks (Aperol Spritz, Bloody Marys, fizz or mocktails), and live music from in-house musicians who play nothing but audience requests from 1pm until 1am. 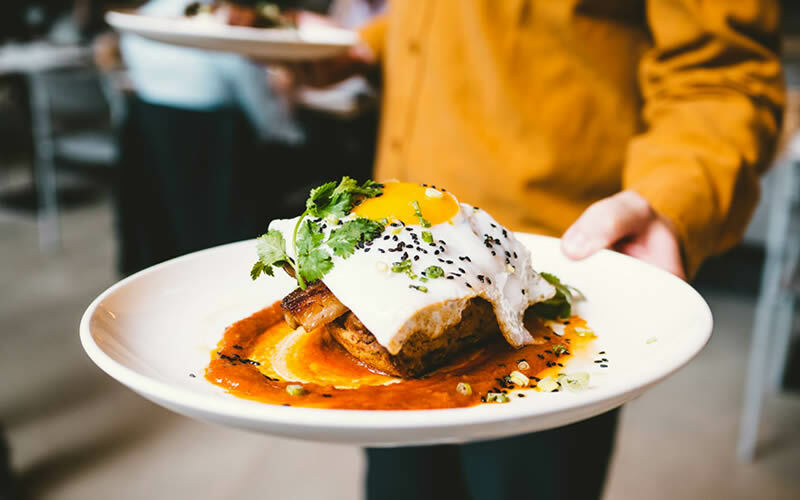 Granary Square Brasserie – This King’s Cross restaurant serves brunch until 4pm, so you don’t have to miss out on your weekend lie-in. The menu covers everything from salads and smoothies to more indulgent options like buttermilk pancakes and asparagus with truffle hollandaise. If you’re bringing the kids along, stop in at the Canopy Market for egg hunting, face painting, and a petting zoo. Percy & Founders – This buzzy Fitzrovia restaurant is the perfect place to spend a lazy Sunday. Choose from slow-roast pork belly, beef sirloin, free-range chicken, or their herb marinated lamb shoulder. As there’s no work the next day, why not upgrade to bottomless Prosecco for £18 a head? The Game Bird – Leave the cooking to the experts and enjoy a traditional Sunday roast at The Game Bird at The Stafford. Choose from roast lamb with all the trimmings or rib of beef, carved tableside from their trolley. Daphne’s – Celebrate Easter the Italian way at Daphne’s in South Kensington. Priced at £35.50 for 3 courses, the Pasqua menu includes roast Cornish lamb, grilled asparagus with stracciatella and zucchini flower, and cannoli Siciliani. St Pancras Brasserie by Searcys – On Easter Sunday and Monday, St Pancras Brasserie is serving a menu bursting with seasonal ingredients. Choose from Wye Valley asparagus, stone bass with Jersey Royals and shellfish sauce, or the roast leg of new season lamb. Heddon Street Kitchen – There’s fun for the whole family at Gordon Ramsay’s West End restaurant. Kids can enjoy face painting, egg hunting, and a trip to the ice-cream bar while grown-ups enjoy bottomless brunch or a Sunday roast. The best bit? Kids eat for free every day of the week. 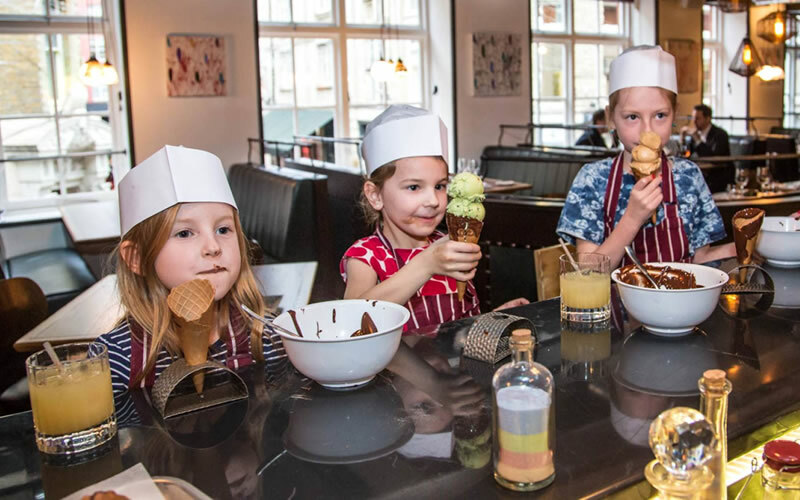 Laurent – Children under 12 dine for free at the Hotel Café Royal’s restaurant until 28th April. 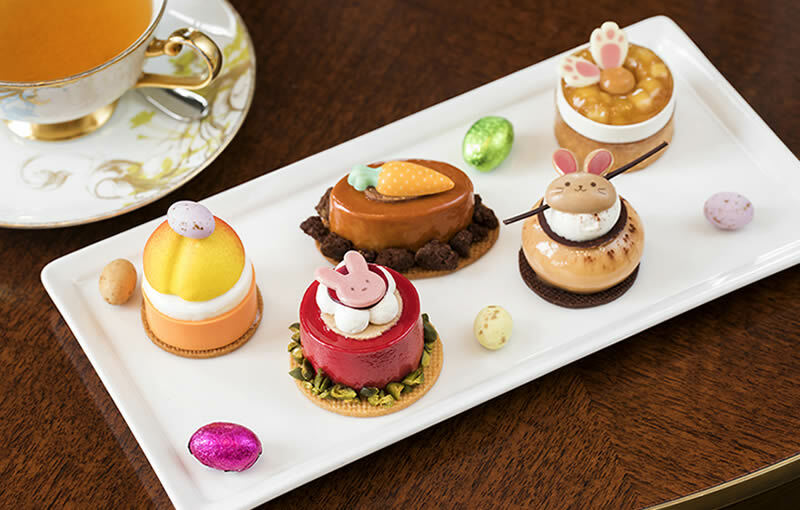 On Easter Sunday, they can embark on an egg hunt through the hotel’s historic halls, followed by chocolate egg decorating with the pastry chefs. Berners Tavern – Treat your little foodies to a special Easter meal at Jason Atherton’s Berners Tavern. They’ll dine for free from the Little People Menu, which includes familiar favourites like ham and cheese toasties and homemade fish fingers and chips. 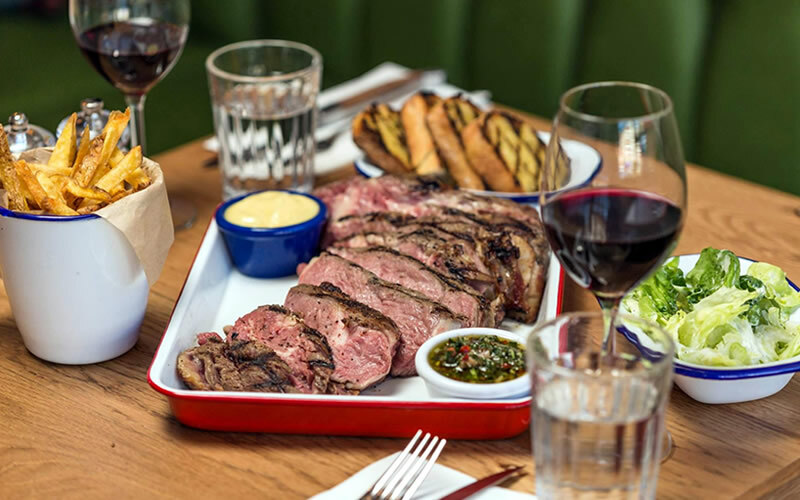 For the grown-ups, there’s a new weekend roast menu to try. 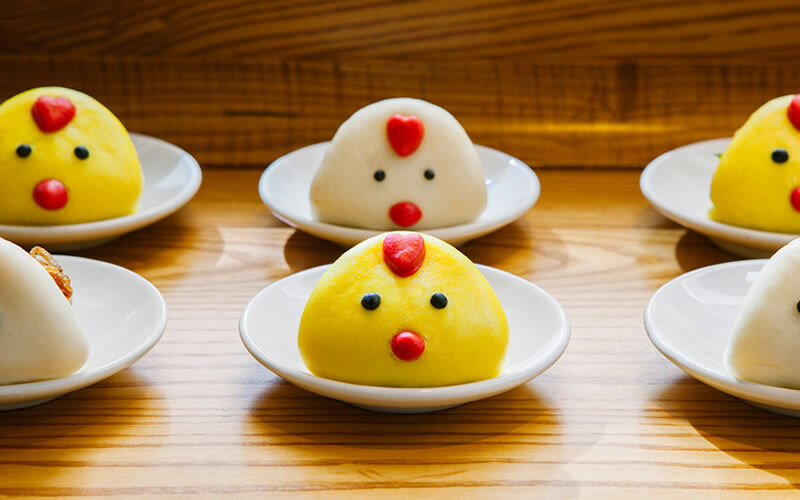 BAO – Alongside their usual menu of Taiwanese small plates, BAO are serving Easter chick baos with a fried chicken filling at their restaurants in Soho and Fitzrovia. They’re only available on Easter Sunday and Monday – don’t miss out! Scoff & Banter Tea Rooms – Satisfy your sweet tooth with Scoff & Banter’s Easter afternoon tea, served with a handcrafted chocolate nest filled with mini eggs. It’s available until 23rd April, priced at £34 per person or £39 with a glass of prosecco. Duddell’s – If you fancy a change from the traditional Sunday roast, why not head to Duddell’s for cocktails and dim sum? They’re serving an ‘Easter Basket’ of steamed dumplings shaped like chicks, goldfish, and Easter bunnies. Don’t miss their twist on the classic Espresso Martini, with a touch of crème de cacao, Cointreau and a Havana 7yo infused cinnamon stick. South Place Hotel – There’s a packed schedule of Easter activities at South Place Hotel, including egg hunts, a gin masterclass, and a Sunday screening of Willy Wonka. South Place Chop House is a top spot for bottomless brunch or a Sunday roast with free-flowing wine. Still searching? Visit OpenTable to find out what more of London’s top restaurants have planned for Easter. When it comes to local dining options, the people of Balham, Richmond, Chelsea, and their neighbours have it pretty good. Bear in mind: pizza’s off the menu at this local Italian. Here, it’s all about the pasta. And no – with dishes like gnocchi with walnuts and gorgonzola, the crowd-pleaser pappardelle with lamb ragu, or classic lasagne – it’s not quite the sort you can rustle up in eight minutes at home. Robin Gill is a man well known in these parts, probably because he owns and has owned a handful of restaurants around Clapham in the past few years. His latest, Sorella, revolves around an Italian-based menu with produce from their own farm, and might just be his best yet. Rihanna, Twitter, and global warming: there are few things of note from 2006 that remain relevant. 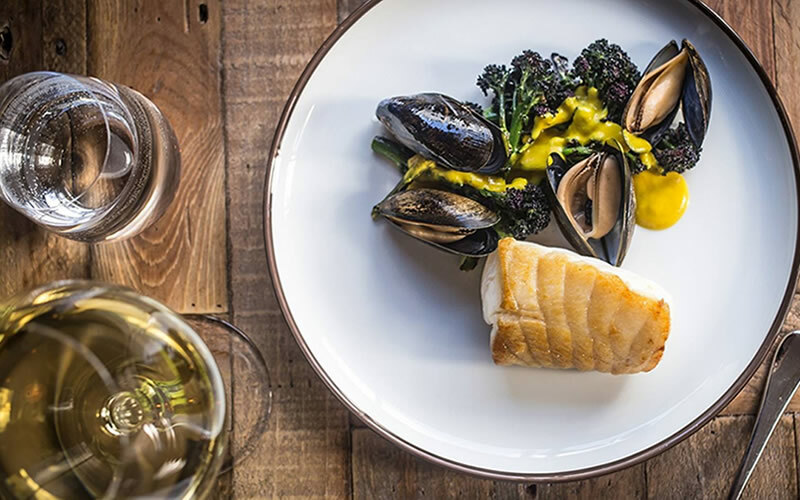 Trinity, however, is another one – Adam Byatt’s seasonal menus are still a draw for local diners. Desserts, like the tarte tatin and Trinity chocolate tart, are well worth leaving room for. As far as London restaurants go, neighbourhood or not, Chez Bruce is a real heavy hitter. Despite its distance from the main goings on of the capital, it’s well known for its modern French cooking and superb cheese board. ‘Restaurants are not about celebrity chefs… they’re about customers,’ says chef-patron Bruce Poole. We couldn’t agree more. Taking a less formal approach than some of his other venues, Gordon Ramsay’s Battersea restaurant is ideal for midweek suppers and drinks with friends. It serves classic British dishes – steaks, fish and chips, ham hock terrine – plus brunch and roasts at the weekend. On warm days, you can dine al fresco in the garden. Hood is passionate about provenance and the friendly staff are more than happy to tell you about their English wine (from Sussex) or their veg (from a farm in Kent). When even the staff are local – the chef, for example, has lived in Streatham for three years – a ‘community restaurant’ is going to be exactly that. Medlar has done everything it can to retain its neighbourhood feel. 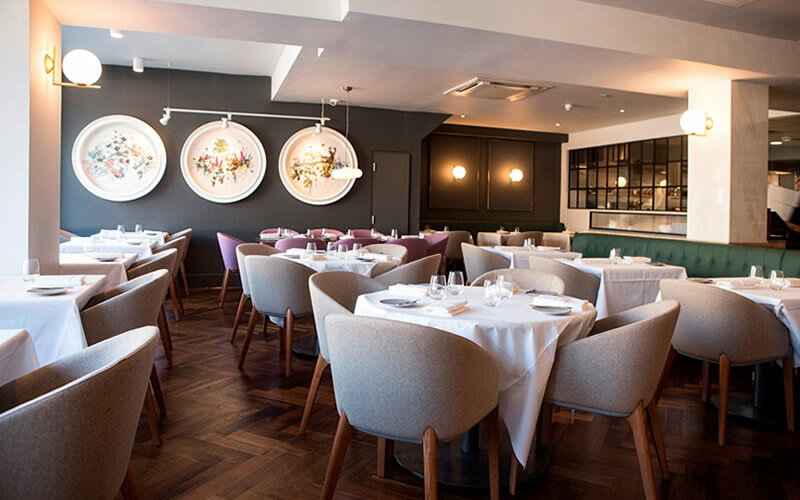 A well-priced menu (lunch, at £35, in Chelsea is a steal), consistency in the quality of its food, welcoming atmosphere, and an informal atmosphere (again, for Chelsea). 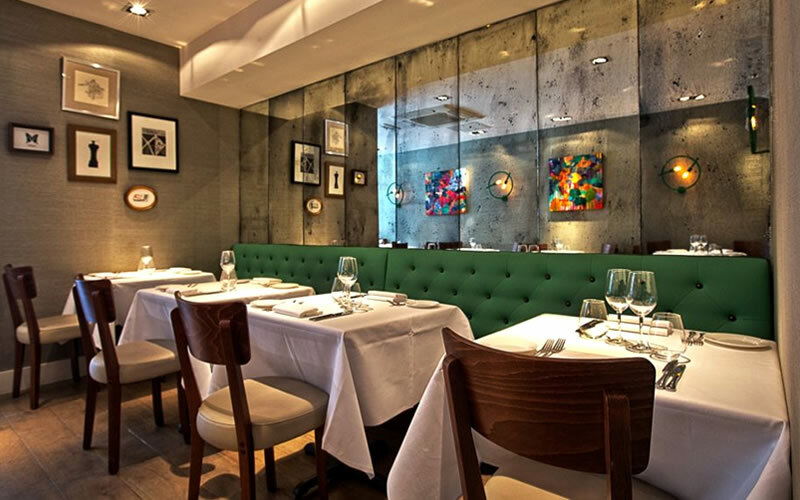 Medlar opened to great reviews in 2011, and recent feedback suggests it’s still worth a visit. Don’t be put off by its dated website ­or extra-long menu – Tooting’s come a long way gastronomically in the last few years, but places like Vijaya Krishna suggest it’s had some culinary merit all along. The food can be described as South Indian in places, with a specific influence from Kerala. Forget Kobe or Argentinian – the benchmark for good beef, anywhere in the world, comes from British native breeds. And Arlo’s – much like Hawksmoor and Blacklock – are hot on showing it off. Here, it comes in the form of bavette (flank) steak: a cheaper, but no less flavoursome, part of the animal. Try the Bavette Bismark, carved and served inside a bone marrow Yorkshire pudding with braised Malbec onions. This is where the gang behind another, newer, neighbourhood haunt (Levan), originally rooted in. With more of a pan-European slant than its Franco-inspired sibling, the focus at Salon is on a seasonal four-course tasting menu, thankfully without the usual ceremony. In proper bistro fashion, it’s a bargain at £36 a head. Not really a restaurant per se, but there’s such dedication to good food here that it might as well be. 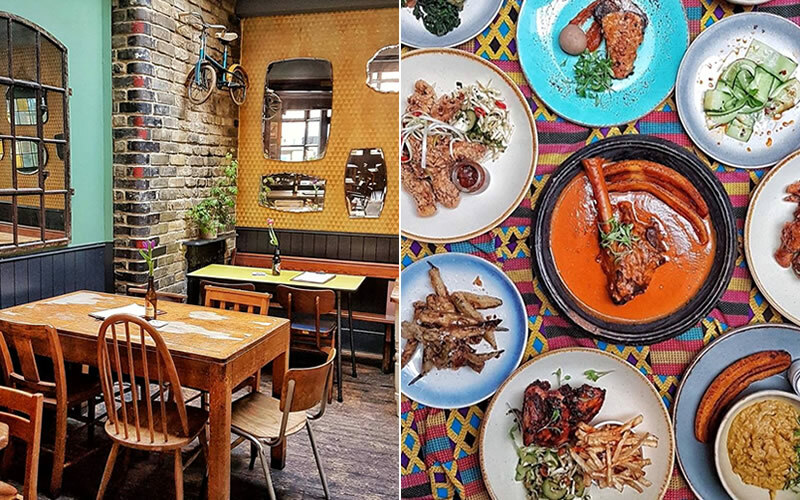 From Monday to Saturday, the pub kitchen is taken over by some of London’s foremost street food traders and nomadic chefs – currently in residence is Brixton favourite Zoe Adjonyoh with her Ghanaian inspired menu. Meanwhile, on Sundays, roasts take centre stage. 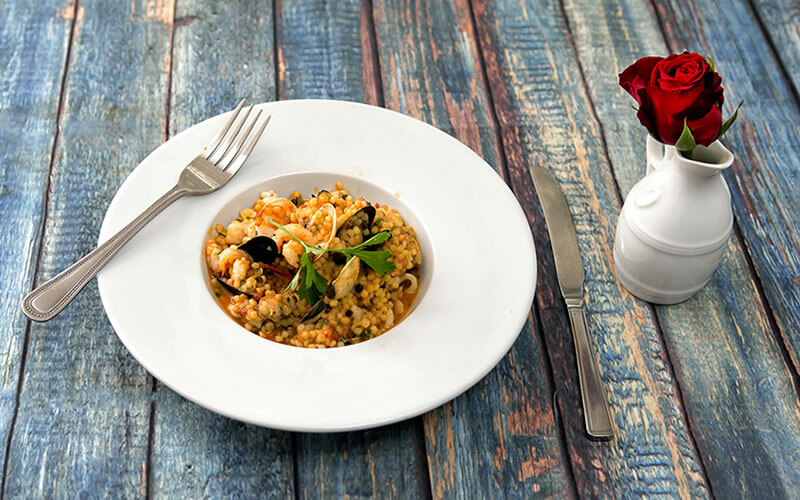 Visit OpenTable to book or discover more restaurants in south west London.